_ Angra is a progressive power metal formation from São Paulo, Brazil. Formed in 1991, with Andre Matos (vocals), Luís Mariutti (bass), Marcos Antunes (drums), André Linhares (guitar) and Rafael Bittencourt (guitar). In 1992, Linhares was replaced by André Hernandes, later replaced by Kiko Loureiro. 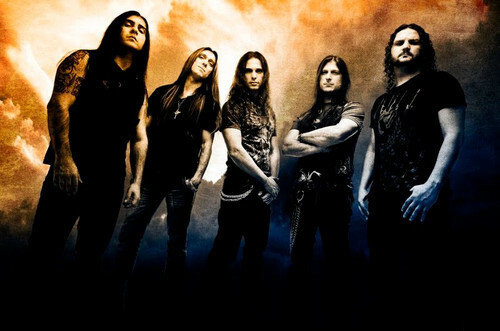 They underwent a big line-up change in 2000, when the vocalist Andre Matos, the bassist Luis Mariutti and the drummer Ricardo Confessori, that have entered after Marcos Antunes (now with Sunsarah), left the band and founded Shaman (later renamed to Shaaman and back to Shaman again) together with Luis’ brother Hugo Mariutti. After being on hiatus for almost two years due to management issues, Angra’s website announced their come back with a slight change in it’s line-up: Ricardo Confessori returns, replacing Aquiles Priester, who decided to dedicate full-time to his side project, Hangar. Shortly after guitarist André Hernandes left the band, Kiko Loureiro, who has played with both Antunes and Bittencourt in other bands, joined Angra. After almost an entire year of rehearsal they released the demo Reaching Horizons in 1992 which was received very positively by critics and achieved unexpected success both in Brazil and Europe. It was one of the first releases from Limb Music Products, which later would become one of Europe’s premier power metal specialty labels. During the recording sessions for their first album Angels Cry, Marcos Antunes left the band. Sieges Even’s drummer Alex Holzwarth was called to finish the album; Ricardo Confessori was later invited to be the new drummer. This change established Angra in its most enduring and prolific form, which lasted from 1993 to 2000. Angels Cry was recorded at Gamma Ray guitarist Kai Hansen’s studio in Hamburg, Germany. The album included performances by Heaven’s Gate guitarist Sascha Paeth as well as Gamma Ray guitarists Kai Hansen and Dirk Schlächter. The album was released in Brazil in 1993 and featured many classical influences as well as an adventurous cover of Kate Bush’s “Wuthering Heights”. The album was a great success in Angra’s native Brazil as well as Japan where it sold over 100,000 copies. That year Angra dominated the polls of the Brazilian magazine Rock Brigade obtaining awards for Best New Band, Best Album, Best Singer, Best Album Cover and Best Keyboard Player. Due to the album’s success in Japan an EP was issued on the Japanese market which included remixed versions of songs from Angels Cry (Evil Warning, Angels Cry, Carry On and Wuthering Heights). In the following year the album was subsequently released in Europe through Dream Circle, and in France by C.N.R. It went on to be very successful both critically and commercially. In 1994 Angra opened for AC/DC in Brazil and was invited to the inaugural Brazilian Monsters of Rock Festival, sharing stage with KISS, Black Sabbath and Slayer. After the festival, the band embarked on what would be a very successful Brazilian tour, which eventually ended in Europe in 1995. Holy Land - an ambitious project involving huge orchestration, choirs, and Brazilian rhythms - was released in 1996. Once again the production was handled by Sascha Paeth and Charlie Bauerfiend. Holy Land proved even more successful than Angels Cry, and the Japanese Victor release, including the bonus track Queen of the Night, went gold. Angra toured Japan for the first time following the huge success of Holy Land. That same year the EP Freedom Call was released including cover versions of Judas Priest´s “Painkiller”, which was followed by the release of the live album Holy Live, recorded in Paris in 1996. In 1998 Angra released the EP Lisbon, followed by the album Fireworks; both were produced by Chris Tsangarides. Fireworks was a departure from Angra’s earlier experimental sound. It focused more on the traditional heavy metal sound, and lacked the classical influences that were apparent in Angels Cry and the Brazilian rhythms that were included in Holy Land. A lengthy world tour was set up in support for the album. Angra made an appearance at the Buenos Aires´s edition of the Monsters of Rock Festival. The Holy Box was released the same year by Lucretia Records including exclusive acoustic tracks. In 2000 Angra co-headlined shows in Europe with Time Machine and Stratovarius. During mid 2000 Angra split, parting ways with vocalist Andre Matos and its entire rhythm section, bassist Luis Mariutti and drummer Ricardo Confessori. After a great deal of speculation concerning the end of the band, remaining guitarists and founders Kiko Loureiro and Rafael Bittencourt started drafting musicians to preserve the band. Symbols’s vocalist Eduardo Falaschi, Paul Di’Anno’s drummer Aquiles Priester and bassist Felipe Andreoli were chosen after what the band called a “rigorous and criterious process involving both technical skills, previous experience and perfect mutual musical understanding”. Rebirth was released in 2001, produced by Dennis Ward. The album was both a critical and commercial success in Brazil and internationally, selling over 100,000 copies worldwide in less than 2 months. The album went gold in Brazil that same year. The EP Hunters and Prey was released in 2002 which included acoustic takes of Rebirth songs, as well as other new material, a cover of “Mama” by Genesis, and their first song with lyrics in Portuguese Caça e Caçador (Portuguese for Hunter and Prey). Angra was a featured guest on many mainstream TV shows in Brazil. Temple of Shadows recording sessions started in January 2004 at Mosh Studios in São Paulo. Dennis Ward once again was at the production role. The album guested famous vocalists Kai Hansen (Gamma Ray), Sabine Edelsbacher (Edenbridge), Hansi Kürsch (Blind Guardian) and the Brazilian legend Milton Nascimento. Temple of Shadow was a concept album based around a character known as The Shadow Hunter and his saga which is described as “a saga of a crusader knight that ends up disputing the expansionist ideals of the Catholic Church in the eleventh century”. Progressive metal influencies permeate the album to an extent never seen before on an Angra release, making it sound closer to Dream Theater and Pain of Salvation. Expanding from the typical power metal sound, the album incorporates orchestras (“No Pain For The Dead”), flamenco (“The Shadow Hunter”), triple timing (“Wishing Well”), and epic vocal parts often including entire choirs, and not limited from female voices. The record sold over 20,000 copies in the first week in Japan alone, selling close to 50,000 copies in Brazil and over 250.000 worldwide. In 2008, Singer Edu Falaschi was originally reported as saying that Angra “has been terminated”, but this was later revealed to be both a misunderstanding and a misreporting of his words. Edu later clarified what was meant by his earlier comments: “Angra is not done; we’re taking a break, a pause. The band is going through some difficult management issues, and all of us are doing our best to get back on the road”. In 2009, the Official Site was put out of function. Instead, the home page announced that the site was under construction and news would be released soon. In March 2009, the Angra’s Official Site announced the return of Ricardo Confessori to the post of drummer of Angra, replacing Aquiles Priester, who left the band to dedicate full force to his band Hangar. Confessori returns to Angra after a nine-years hiatus. The band is currently touring along with another brazilian band, Sepultura. Angra’s first line-up was formed in 1991 with Andre Matos, Rafael Bittencourt, Kiko Loureiro, Luís Mariutti and Marco Antunes. They recorded their first EP Reaching Horizons, which was followed by Marco Antunes leaving the band in 1992 just prior to the recording of their first album Angels Cry. Alex Holzwarth, Rhapsody of Fire, was chosen as a replacement for the recording sessions and was later replaced by Ricardo Confessori. This was the longest lived Angra line-up. In 2000 Matos, Mariutti and Confessori left the band, eventually grouping together to form the power metal band Shaaman. In 2001 Eduardo Falaschi, Felipe Andreoli and Aquiles Priester joined the band for the release of Rebirth. The band also recruited keyboard players on different occasions after Andre Matos’ departure but they never received “member” status. In late 2008, Priester left the band due to differences with other band members and later in 2009, Confessori returned to take over drums.